At the time of the Columbian Exposition in Chicago in 1893, Cody’s Wild West Show was located nearby. One of the means used to publicize the exposition was a horse race from Chadron, Nebraska, to Chicago. Buffalo Bill and a small crowd greeted the winner of the race, John Berry, and Cody added $500 to the original prize money Berry received. Cody and Frank North started a cattle ranch sixty-five miles north of North Platte, Nebraska, and during the summers, he spent part of his time there. This was the first ranch with headquarters north of the Platte River valley in the Sandhills region. Later Cody developed Scout’s Rest Ranch near North Platte – now designated as a state historical park. Beyond the Wild West Show, Cody’s most significant project was that of developing the town of Cody, Wyoming. In Cody’s scouting days, he grew enamored of the land in Bighorn Basin. Cody provided all of the furnishings for the nearby Sheridan Inn Hotel opened in Sheridan, Wyoming, in June of 1893 (The hotel was built by the Burlington & Missouri River Railroad and the Sheridan Land Company at a cost of $25,000 to service the new railroad across the street). Cody’s quest of his ideal was impressive. When his initial efforts to raise the two million dollars necessary for irrigation of the land using the Shoshone River failed, he went to his friend Teddy Roosevelt for support. By 1904, the Department of Interior initiated the Shoshone Reclamation Act, and by 1910, two dams were in operation, and 16,200 acres were under irrigation. He was also quite instrumental in developing the tourism trade into nearby Yellowstone National Park. Gradually, the Wild West Show’s popularity began to fade. In 1910, Cody began a series of Farewell tours, after which he intended to retire to Wyoming. 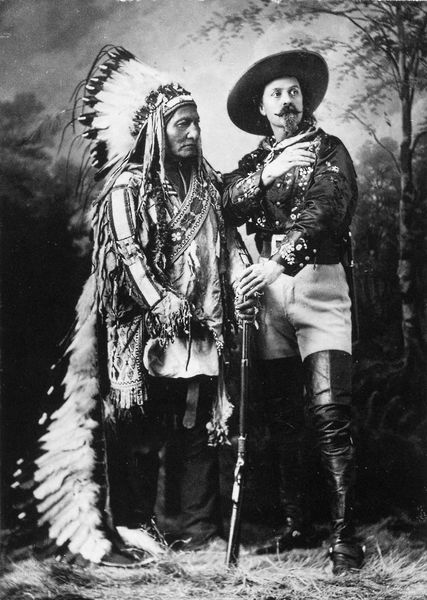 He combined his tour with Pawnee Bill’s Far East Show as Buffalo Bill’s Wild West and Pawnee Bill’s Far East Show in 1908. By 1912, Bill needed financing for his show and went to Harry Tammen of Denver for a $20,000 loan. The following year the combined show arrived for a Denver performance date at the time the $20,000 loan was due. To their surprise, the show was seized by the sheriff and held to pay off the $20,000 debt. Since Cody did not have that much cash available at the time and Tammen would not extend the loan, Buffalo Bill’s Wild West and Pawnee Bill’s Far East was sold at auction in Denver.